Gripsweat - Neutral Milk Hotel 1/200 Vinyl Box Set, never played, excellent condition!!! Neutral Milk Hotel 1/200 Vinyl Box Set, never played, excellent condition!!! This is the 2014 pressing of Neutral Milk Hotel's limited vinyl box set. None of the records have ever been played, your needle will be the first one on them! Most definitely a collectors item!!!! The box itself has minimal to no shelf where, all corners in excellent condition. Every sleeve, vinyl, and poster within the box are graded MINT. FREE SHIPPING to the US. I will ship to Canada but shipping will likely be another $40-$50 USD. Returns accepted within 15 calendar days, buyer pays all shipping costs. Shipping will be media mail and ships within 3-5 business days of payment. I take HIGH PRIDE with care and packaging with shipping. Thank you very much and have a nice day!!! PLEASE CHECK OUT MY OTHER LISTINGS! The contents are as follows per Discogs: Released in February 2014 and limited to 200 copies. This limited edition experimental cover precedes the original box set cover. 2 variations were made available via walkingwallofwords.com; this is the white ink on metallic silver background version. Published by Egg As A Whole Music / BMG Songs Inc.
Avery Island, LP with deluxe gatefold jacket, and additional artwork. Includes a full-size insert. Recorded at Elephant 6 and Dane and Marisa's House Feb-May 1995 except Marching Theme which occured in June of 1994. Produced on 4-track. Published by egg as a whole music/BMG Songs, Inc. This album issued under license from NMH. Recorded on four-track. Remixed at Garden Gate Studio, from the original cassette masters. Both 10"s and the Little Birds 7" each include a small insert card with credits and artwork. 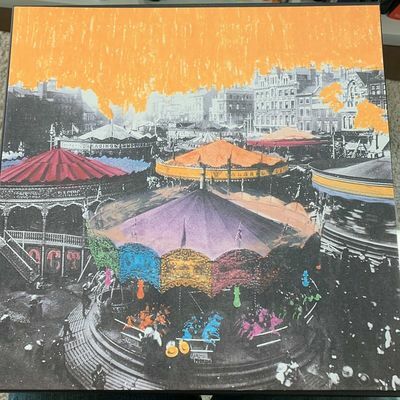 In addition, the box set includes a small insert card with additional thanks and credits, and two additional 24" x 24" posters; one of the box cover art and one of the flying gramophone art. Dr. Dre The Chronic LP STILL SEALED Death Row Records 2001 Reissue Snoop Dogg!! !